Illustrated in black-and-white. Jack and Annie are whisked forty years "forward in time and land at an international space station on the moon. There they don space suits and go exploring the lunar surface in search of the fourth object needed to free the enchantress Morgan le Fay from a powerful spell. The #1 bestselling chapter book series of all time celebrates 25 years with new covers and a new, easy-to-use numbering system! Three …two…one…BLAST OFF! 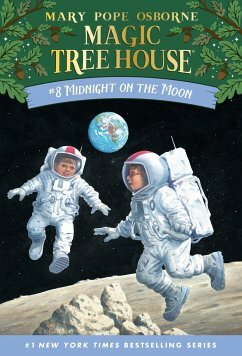 The Magic Tree House whisks Jack and Annie off to the moon-and the future. Their mission? To find the last "M" thing that will free Morgan from the spell. Can they do it before the air in their oxygen tank runs out? Will the mysterious moon man help them? And why is Peanut the mouse acting so strange? Did you know that there's a Magic Tree House book for every kid? Magic Tree House: Adventures with Jack and Annie, perfect for readers who are just beginning chapter books Merlin Missions: More challenging adventures for the experienced reader Super Edition: A longer and more dangerous adventure Fact Trackers: Nonfiction companions to your favorite Magic Tree House adventures Have more fun with Jack and Annie at MagicTreeHouse.com! Ein tolles Buch. Nicht schwer zu lesen. Also gut für Englischanfänger.